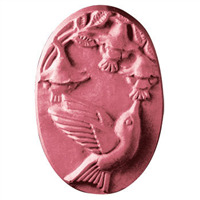 Bar Length: 2.35" Bar Width: 2.35"
The Mr. Owl Soap Mold features an owl that reminds us of an owl who loves to lick lollipops! 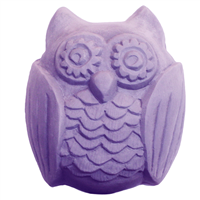 This classic owl has detailed feathers and big eyes sure to stand out in soap. 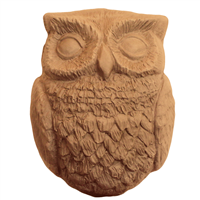 Sculpted with fine, feathery details, our new Owl Soap Mold features a wise old friend perched on a branch, keeping an eye out for field mice. Perfect for late night bookworms, ornithologists, and Harry Potter fans, this quizzical critter is sure to turn heads with his thoughtful gaze. A peacock with his long feathery tail is featured on a fine-leather textured design. Each mold cavity is oval. 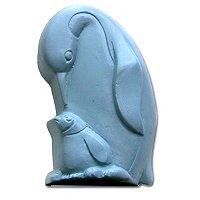 This Penguin Soap Mold shows two emperor penguins, a mother and a baby, huddling together to keep warm. The mother is kissing her baby’s head with her beak. 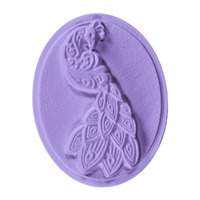 The Turkey Mold is the perfect soap mold for Thanksgiving time! 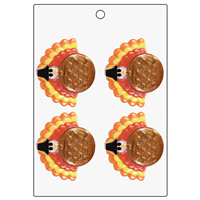 Use this gobbly guy to create soaps for all you are thankful for. 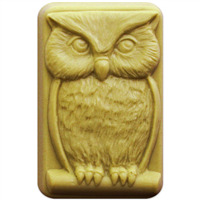 The Woodland Owl Soap Mold features a friendly owl with welcoming wide-eyes. 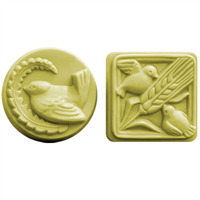 We love the woodland animal trend and think this cute owl soap mold is perfect for kids soap bars or baby showers! Bar Depth: 1.45" Bar Length: 3"